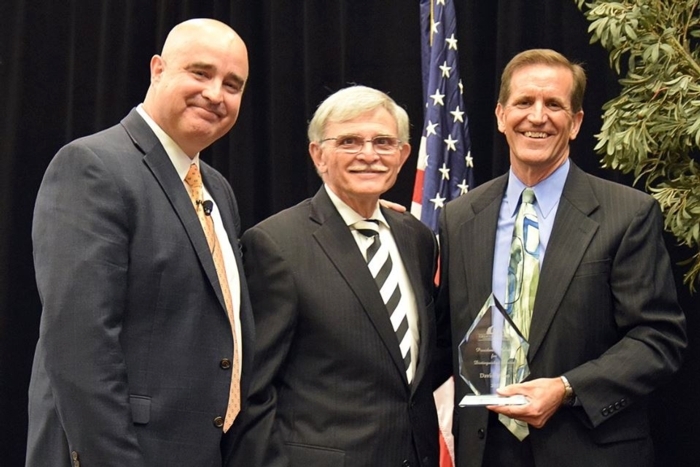 David Bruno of ZRG Partners, LLC is the first ever recipient of the Presidents Award for Distinguished Service! A fact you probably "Did Not" know about Ron Hagan !!! 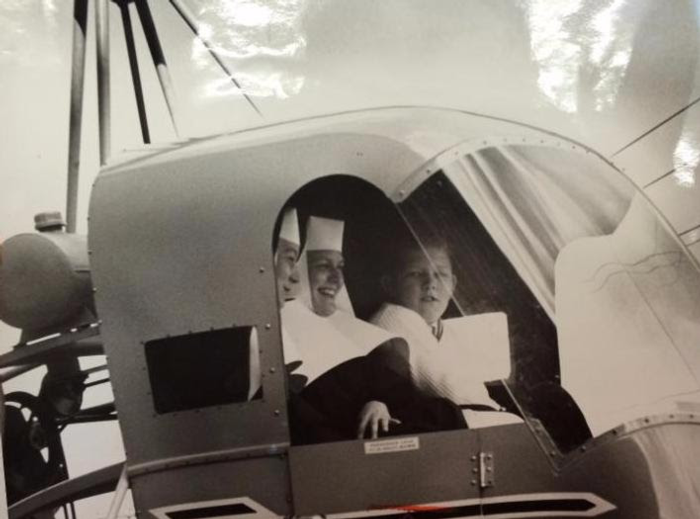 Throwback Thursday - March 23, 1962 - Ursuline Sisters Mary Leah and Mary Bernard take a helicopter ride with Ronald Hagan '66. The helicopter, three-fourths the usual size, could hover no more than 12 feet over the Ursuline turf. Sharon Nicastro donated one of her kidneys to a stranger in San Diego. In exchange, John, her husband of 48 years, received a kidney from a Columbus woman he’s never met. It’s called living donation, and the couple learned about it from their daughter, Elyce Nicastro Ervin, a University of Toledo professor. Last month marked one year since John got his new kidney and Sharon donated one of hers. He was diagnosed in 2006 with chronic kidney disease. “In 2009, his doctor told us, ‘It’s not a question of if he’ll need dialysis, but when,’” Sharon said. For years, John suffered from fatigue and chest and shoulder pain, but stress tests never indicated he had a problem. In 2014, Sharon persuaded her husband to undergo a colonoscopy. During that procedure, John’s colon was nicked. That’s when doctors discovered blockages to his heart. Some of them were 100 percent blocked. He underwent open-heart surgery and that led to his kidneys shutting down. “It was three times a week for four hours.” John said. “I told [Sharon,] ‘I don’t know how long I’m going to be able to do this,’” John said. Dialysis hampered his ability to enjoy life. If the couple went away for vacation, they had to find a dialysis clinic where John could get a treatment. If they wanted to take a weekend trip, they had to be back by Sunday because John had a dialysis session scheduled for Monday. He decided a year would be as long as he could take it. The couple looked into the living-donor idea. 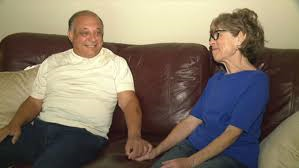 Sharon wasn’t a match to John, and a transplant coordinator at a Mahoning Valley hospital told them they were too old for the living-donor program. They were directed to register at a few hospitals to try to get a cadaver kidney. One of those hospitals was the Cleveland Clinic. A transplant coordinator there told them their ages didn’t disqualify them from the living-donor program. They registered. Sharon endured a series of tests and she was matched to the San Diego recipient. John was then matched to the Columbus donor. On Aug. 19, 2015, they both went into surgery. Sharon worried at first, but she trusted her doctors. She loves her husband and wanted to help him. They remained in the hospital a few days and then went to their daughter’s home to recuperate. “I didn’t realize how bad I felt until after the transplant,” John said. The couple urges others to research their options if faced with a similar situation and always get a second opinion. John continues to take 28 pills per day to prevent organ rejection, but it’s preferable to dialysis, he said. John also has more energy. “Yesterday we went to the Lily Pond” in Mill Creek Park “and he was able to walk all the way around it,” Sharon said. He wouldn’t have been able to do that before. John is grateful to his wife. “She really saved two lives,” he said. The Honorable Cheryl L Waite and Penny Wells. 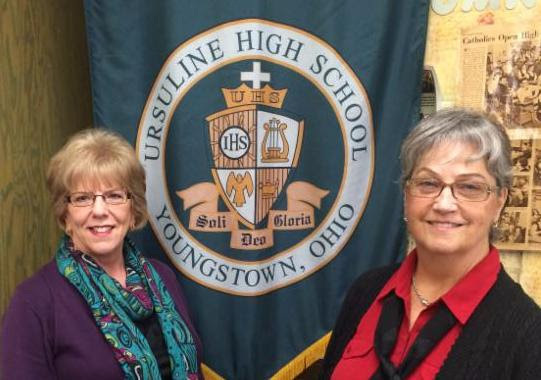 Pat Cullen Hanley and Mary Celeste Sturgeon Armbrecht, members of the Class of 1966, returned to Ursuline this week for a tour. They have been friends since their grade school days at Saint Edward. Mary Celeste was traveling through Youngstown on her way back to San Jose, California. Pat resides in Girard. Last week's e-newsletter included a "Throwback Thursday" picture of the 1966 basketball coaches and managers. We then received the following email from Jerry Sweed ('66), one of the student managers in the photo. Ron Moschella '68 (Boardman) and Dan Gorski '74 (Boardman). A tribute to Coach Beck's fine mentoring." Published: Thu, November 12, 2015 @ 12:05 a.m.
Keynote Media Group, a marketing and branding firm downtown, has launched a musical-instrument donation program to help needy students and schools in the area. The “Let’s Start A Band!” initiative is designed to collect playable used band and orchestra instruments and get them in into the hands of young people who can’t afford to buy or rent them, said Richard Hahn, Keynote founder and CEO. Hahn is a graduate of YSU’s Dana School of Music and former public-school music teacher. A number of inquiries have been received from adults who have their high-school clarinet or trumpet still in the attic gathering dust. Using social media as the main marketing strategy for the program, Hahn said he already has had a donation inquiry from Kentucky. Once the instruments have been deemed playable, they will be cleaned and given either to the band director or to a needy family at the school’s recommendation. Any interested donors, school principals or band directors wishing to inquire about the program can go online to the Facebook page www.facebook.com/letsstartaband. The Feast of Saint Ursula was celebrated with a special Mass on Wednesday, October 21. 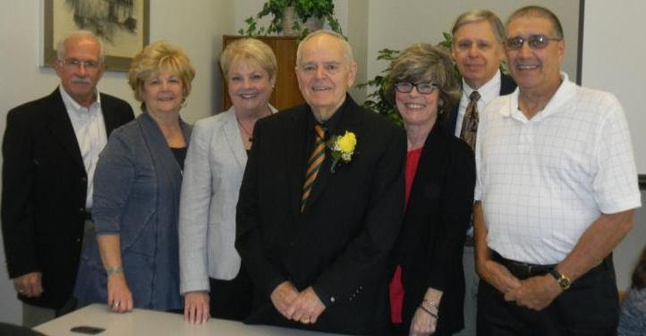 Following the liturgy, the Annual Distinguished Alumni Awards were presented to Ruth Carroll '57 and John Ulicney '54. To receive this award, alumni must have distinguished themselves by service to Ursuline and/or to the community at large. A complete story on Ruth and John will appear in the next Alumni Quarterly. 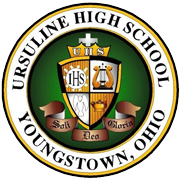 Two Ursuline Alumni were honored at the recent Youngstown State University Beeghly College of Education Outstanding Alumni Awards Ceremony. 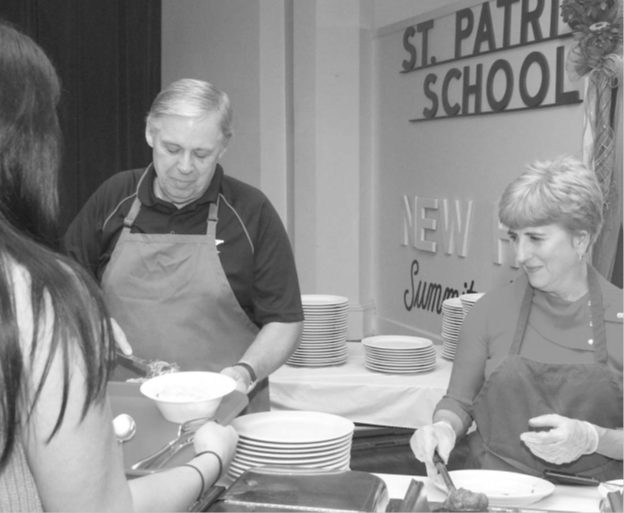 Carol Thomas Zink ('66) has been an educator with the Lincoln, Nebraska Public Schools for the majority of her career. Matt Manley ('79) is the Director of Professional Development and Principal at West Branch Middle School/Damascus Elementary. 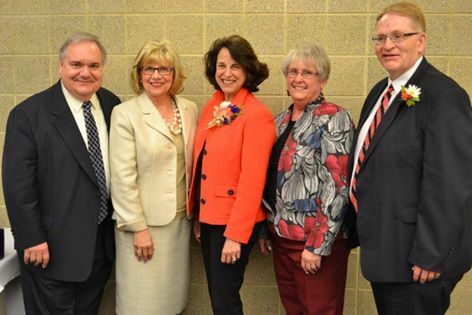 Dante Zambrini '72 (Interim Vice President - Eastern Gateway Community College), Dr. Mary Lou Dutko DiPillo '67 (Associate Dean - Beeghly College of Education), Carol Thomas Zink, Cindy Kofler Korchnak '66 (Secretary - Beeghly College of Education), Matt Manley.